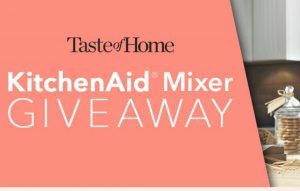 Enter to win a KitchenAid ArtisanÂ® Series 5 Quart Tilt-Head Stand Mixer! PRIZES: Five (5) winners will be selected. Each winner will receive a KitchenAid ArtisanÂ® Series 5 Quart Tilt-Head Stand Mixer (KSM150PSER). Approximate retail value (ARV) is $429.99 each. Total ARV for all prizes is $2,149.95.